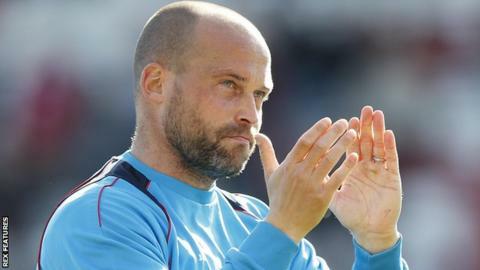 Torquay United boss Kevin Nicholson has called on the club's owners to be "more transparent" and quash speculation about their motives at Plainmoor. Gaming International bought the club in December, with chairman Clarke Osborne keen to buy the freehold of the ground. "They've got to show with their actions, not just words, they're in it for the real reasons," Nicholson said. "I think they need to come out and build a relationship with the fans because rumours are a dangerous thing." Earlier this month, Nicholson, whose team are two points above the National League relegation zone, said he had been given funds to strengthen his squad, but he did not bring any players in before the deadline on 23 March. Osborne, who is yet to speak to the media since taking over, has brought Geoff Harrop in as general manager to help Nicholson. "There's a huge amount of rumour and stuff with them [the owners] and I do think that they need to step in and have a chat with the fans and be more transparent, and let them know what's going on," Nicholson added to BBC Sport. "I can't lie. I can't make anything up. I've had 12 months of rumour rammed down my throat about Geoff Harrop and what he's going to bring, what he's not going to bring and what his motives are. "All I can say is that since he's been in I've met with him virtually daily and we've had positive discussions about the future of the club. "I can't come out and say we're best mates, but I can say that we've got a strong working relationship that will only get stronger as I learn what he's about."